MMC reinforced its commitment to environmental sustainability through the creation of a related Strategic Plan Implementation Network (SPIN) Team in early 2019. Its membership spans students, faculty, staff and executive leadership and the group works to propel sustainability initiatives. In 2017, MMC introduced a new major and minor in Urban and Environmental Sustainability (UES), replacing existing programs in Environmental Studies. These courses of study prepare students for careers finding sustainable solutions to environmental problems in a rapidly urbanizing world. The UES program is holistic and interdisciplinary, requiring coursework in the natural and social sciences as well as the humanities. Andreas Hernandez and students during a discussion in Costa RicaStudy travel courses like Prof. Andreas Hernandez’s on eco-tourism and sustainability in Costa Rica allow students to study economic development and sustainability through a variety of lenses while visiting important sites of the eco-tourism and conservation movements. The College proudly hosts the annual Barry Commoner Lecture on the Environment, which has featured stellar speakers including Andrew Revkin, Majora Carter, Carl Safina, and Alex Steffen on topics like chemical contaminants and environmental health, future cities, the ethics of science, climate change, and sustainable development. MMC’s Shanahan Library offers access to the J-STOR Sustainability Database. 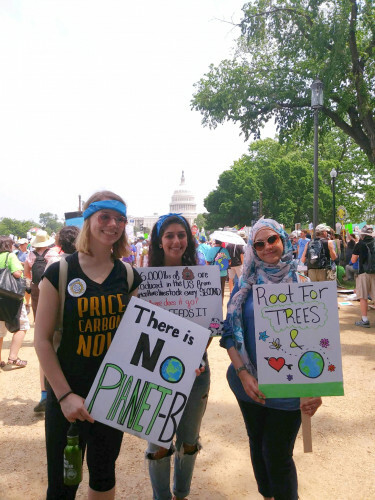 MMC students participate in the DC Climate MarchFor over ten years, MMC students have been collectively active in sustainability efforts. The GoGreen Coalition, an activist registered student organization focused on realizing a greener campus through school-wide and community events, fundraisers, and campaigns, was succeeded by SustainMMC, a group of students who executed a well-attended walkout for sustainability in Fall 2019. 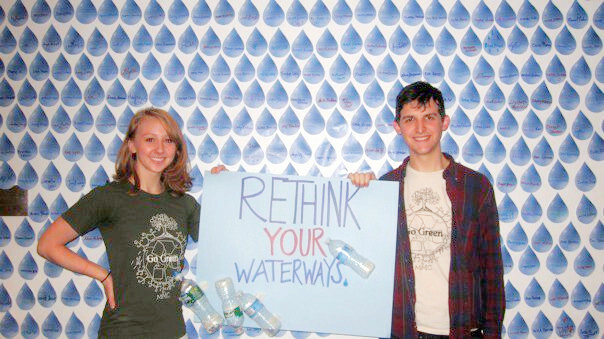 Some of the most notable student organizing efforts include MMC’s Free Water Campaign, in which water filling stations were implemented and the sale of bottled water was prohibited on campus, a Take the Stairs campaign, and participation in the DC Climate March. Marymount Manhattan College engages Royal Waste for recycling and offsite sorting, ensuring a more efficient recycling operation than those that rely on proper sorting by consumers. MMC was a charter member of the American College and University Presidents’ Climate Commitment, and took proactive steps to purchase electricity from renewable sources and to conduct a greenhouse gas inventory. The College has implemented a Building Management System that monitors/regulates HVAC system energy use. MMC is enrolled in Bright Power’s Mobius program, which allows for real time energy management and provides support for the College through deferred maintenance planning, capital planning, and system tracking reports/data analysis. Other sustainability initiatives include the modernization of elevators at the 55th Street Residence Hall and the commission of a Main Campus elevator usage study.